Marine A – Free Him Now! Just two out of 600 females who have ran from the West to join the Islamic State (Isis) have returned home from Syria, government figures show. But walking into the warzone is a one-way-ticket with a small chance of return, with little realising this, with only two of the so-called jihadi brides having escaped home. In comparison to this, European government officials which monitor these numbers note that almost one-third of male jihadists have escaped the clutches of IS are on their way back from Syria. According to researchers, many women and girls are unable to escape from the warzone – even if they realise they have made a huge mistake. The girls who leave the west to join IS are married off straight away, either in Turkey or when they cross into Syria. There are around 20,000 foreign fighters and approximately 5,000 European fighters in Syria, so there is no shortage of men looking for wives. That number is expected to double by the end of 2015. The women are not allowed to travel without a male, if they do they could face punishment, according to material IS published. Sterlina Petalo is a Dutch teenager who converted to Islam, and came to known as Aicha. She travelled to Syria in 2014 to marry a Dutch jihadi fighter there and managed to return months later – it is assumed she made her way to Turkey, where her mother picked her up and brought her back to the Netherlands. Back home, she was immediately arrested on suspicion of joining a terror group. A 25-year-old Briton, who police did not name also made her way back to the UK along with her toddler that she took all the way to Raqqa. She decided she made a mistake and called home, she made her way back to Turkey and called her father there who met her there. In the UK she was detained and charged but is now free on bail. Currently 60 British women and girls have fled the UK to become jihadi brides, including three girls from Bethnal Green in East London who ran away in February. Amira Abase, 15, Shamima Begum, 15, and Kadiza Sultana, 16, were captured on CCTV before arriving in Syria. The video was recorded on 17 February, the day the three friends left their homes in East London, after telling their families they would be out for the day. 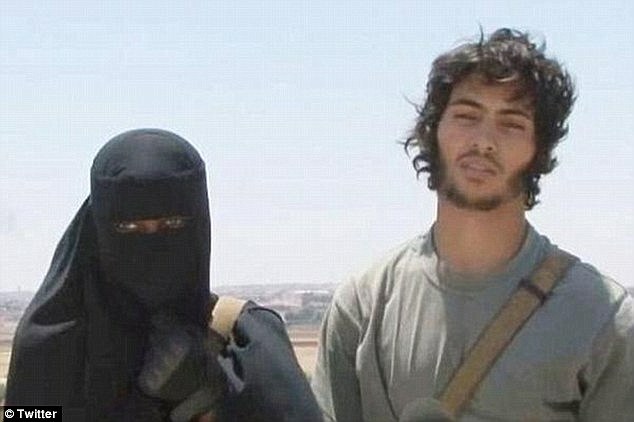 They are now believed to be living in the IS stronghold Raqqa, however reports suggest that they have been separated and possibly married off to fighters as jihadi brides. 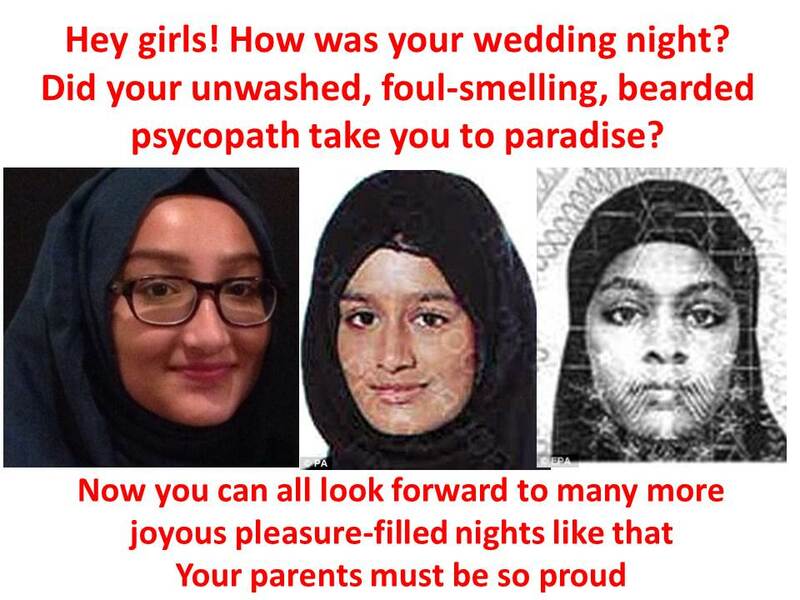 These three girls left the UK on their own free will and are now apparently are being trained for “special missions’ and are likely to die in the Middle East as suicide bombers Um Asmah, a Islamic State commander who is now on the run, told Sky News. Um Asmah said the girls were “very, very happy” on arrival and had been laughing and smiling, but they were unprepared and had little experience of living permanently veiled and under the strict regime. Their fate has already been determined by the terror group, she explained, adding: “Everything is already decided for you and you cannot evade it or refuse it. You cannot have a mind of your own,” Asmah told Sky News. She said the Bethnal Green trio are special to the terror group, but the extremist group has plenty more foreign girls, with more joining each month. This week, Metropolitan Police counter terrorism officers stopped a 16-year-old girl from London travelling to Syria after she was groomed on Twitter to flee to the war zone and marry an IS soldier. Reblogged this on Belfast Child.